my HDA is a Atom D510 machine with 2 gigs of RAM and just 320GB HDD but it's gonna be loaded with a 1TB hdd asap. woohoo! my girlfriend agreed to let me buy new stuff!!! We're getting a HP ProLiant ML110 G6 Xeon Quad Core with 4GB RAM, SmartArray RAID card and ILO (Integrated Lights Out management). The drink is Jameson's whiskey, neat. Well, mine is an older machine... and a failure at that too. Running bare minimums. Need to upgrade, but I don't have the money. If anybody really, really wants pics of the dino, I'll post. And yes, I left the hostname as is. Guess I'm up for a new one too. 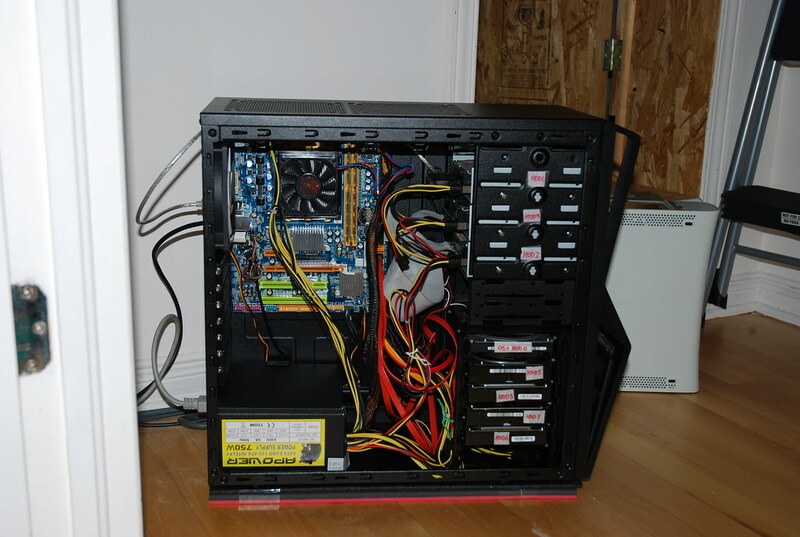 Here's my little diy homeserver, "mad props" to the friendly folks in #amahi for the little bit of tweaking that was needed to get it to work. Gigabyte ga-510ud motherboard with 4gigs of ram, 30gb ssd to hold amahi and 3x2tb samsung ecodrives (for now..) for storage. Fractal Design array case, for size comparison the box on the right is a Zotac Zbox (pretty small). Motherboard: Biostar A760G; 6 x SATA + 2 x IDE connectors! @nogaz Really nice case! Love it! i'm still on a 5-year old box! yup that's the one. everything is working fine after selecting ext3 as a filesystem type. Samsung was very nice to send me 2 new (refurb?) drives since 2 drives got thrashed during the first install phase. I've since set up md-raid (I'm not using the software raid on the mainboard): md0 is 2x750Gb; md1 is 2x1TB. I tested failing a drive (the "small" one; the rebuild takes quite long) and that worked fine so I'm glad that's worked out. I also set up something new as a backup for my gf's backups on her Mac. Time Machine is quite finicky when it comes to the drive that it's backing up to, so I experimented a little. I set up an iSCSI server on the Amahi box (1 LV that's exported as an iSCSI lun). I then installed globalSAN iSCSI Initiator for OS X by Studio Network Solutions (free (only community supported) iSCSI client for OS X) on the Mac. I configured it to "see" the iSCSI lun; since it's presented to the OS as a normal disk Time Machine accepts this without any tweaking; of course you need to partition the drive first (it's a blank disk as far as the Mac is concerned). If someone wants to have a more thorough explanation I'll be glad to write it up.